A 61-year-old-male with a history of hypertension, type 2 diabetes mellitus, and hypercholesterolemia presents with worsening bilateral weakness for one year. Physical examination revealed 5/5 motor strength, intact deep tendon reflexes, and no muscle atrophy bilaterally. Sensation was intact bilaterally. 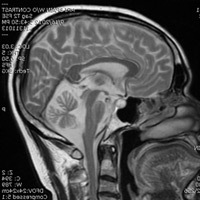 MRI of the brain without contrast revealed atrophy of the cerebellum best demonstrated on the sagittal T2 weighted images through the posterior fossa. Axial T2 and FLAIR images demonstrate cruciform hyperintensity in the pons representing loss of transverse myelinated pontocerebellar and midline raphe fibres of the pons with preservation of the pontine tegmentum and corticospinal tracts. This has been referred to in the radiology literature as the “hot cross bun” sign. OPCA or MSA is classified as a neurodegenerative disorder that involves the olivopontocerebellar complex and the basal ganglia. Specific imaging findings are associated with a variety of neurodegenerative disorders based on the specific type of clinical symptoms. 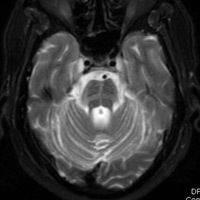 MSA is associated with striatonigral degeneration with Parkinsonism as the dominant feature. Shy-Drager syndrome with autonomic failure is another entity. 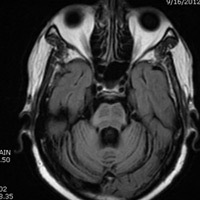 And OPCA when MSA is associated with cerebellar symptoms (such as ataxia) is yet another entity. Treatment is essentially palliative. Dopamine agonists often are prescribed but with little benefit. Gait-assistance devices are frequently employed. — Dhiraj Rajkumar, MD, MBA, is a fellow in diagnostic neuroradiology at Baylor College of Medicine in Houston. — Pedro J. Diaz-Marchan, MD, is an associate professor of radiology at Baylor College of Medicine.